Manifest Season 1 Episode 14 Recap: Do the Returned Have Special Powers? 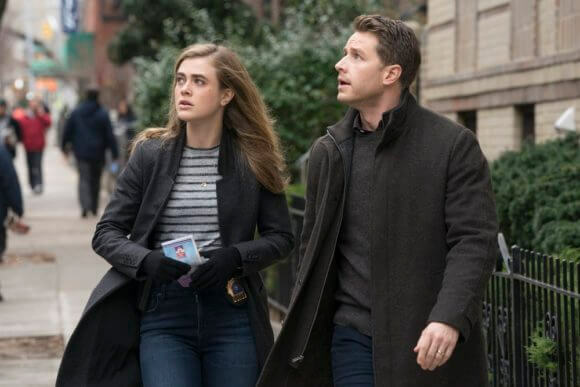 “We need to figure out what Zeke’s return means for the bigger picture,” says Ben (Josh Dallas) to Michaela (Melissa Roxburgh) as they talk about keeping Zeke out of sight and safe from the world in season one episode 14 of NBC’s mystery/thriller series, Manifest. Season one episode 14 begins with Michaela bringing Zeke (Matt Long) home to her apartment. She informs him he can stay with her for a couple of days and suggests he takes the couch. At first Matt’s reluctant, but Michaela reminds him that the calling wants them to do something together and they need to see it through. She also tells him it would be best if he kept a low profile and mentions that the military isn’t on their side. Adrian (Jared Grimes) has started his own church/cult called the Church of the Returned. He’s preaching that those on Flight 828 are the chosen ones to do good and help the world. Ben’s back at home with Olive (Luna Blaise) going over the drawing of Michaela and Zeke. Michaela calls Ben to let him know she and Zeke are back in the city and that he’s staying at her place. Meanwhile, Lourdes (Victoria Cartagena) is trying to be intimate with Jared who’s once again not in the mood. Lourdes gets frustrated and reminds him the doctor cleared him weeks ago. Jared says he’s not ready yet and Lourdes asks if Michaela is back. Jared claims he doesn’t know but gets uncomfortable with her bringing it up. That night, Zeke hears growling and opens the door of Michaela’s apartment to find a wolf snarling at him. It lunges his direction. Fortunately, it’s just a nightmare. Dr. Saanvi Bahl (Parveen Kaur) gets a visit at the hospital from a woman named Alice who asks her to look at her husband’s case. He has cancer and she’s been told he’s terminal but wants a second opinion. Dr. Bahl tries to explain she does clinical trials, but reluctantly agrees when Alice, who seems desperate, pleads for her to try to save her hubby. While retrieving her husband’s medical paperwork, Alice drops a few on the floor. Over at Ben’s, Zeke describes his calling with the wolf. They have him try to talk to Cal about it, thinking maybe he can draw what Zeke saw. However, Cal becomes uncomfortable and asks to be allowed to go to his room. He doesn’t want to do this anymore. Ben tells Grace (Athena Karkanis) he’s worried because Saanvi isn’t returning his texts which isn’t like her. Grace suggests he check on her at the hospital and assures him she’ll keep an eye on Zeke while he’s gone. Alice talks Dr. Bahl into visiting her husband and, unfortunately, his disease is too far along. Dr. Bahl can only suggest Alice make her husband comfortable for his remaining days as there isn’t any additional treatment that might help him at this point. Alice becomes upset, yelling that Dr. Bahl must be able to cure him since she’s one of the chosen. Saanvi attempts to tell Alice she’s just a doctor, but Alice becomes furious and slaps her across the face. She then pulls out a gun and demands Dr. Bahl cure her husband or else. Ben searches the hospital but can’t find Saanvi. He then notices a paper on the floor of her office promoting the Church of the Returned. A hand-written note on the flyer suggests Dr. Saanvi can help. Back at the Stone house, Grace tells Zeke he might want to consider letting his family know he’s back. Speaking from personal experience, she tells him how important it is to a mother to know her child is okay. She also reminds a moody Zeke that Cal risked his life to help save him. That must mean something. Ben visits the Church of the Returned and is shocked to find Adrian’s running it. Adrian explains his calling is to pass on the word about the returned and how they are the chosen ones. Ben gets fed up but looks around and spots posts on a bulletin board that match the handwriting on paperwork left in Saanvi’s office. Dr. Bahl speaks with Alice’s husband, Jacob, about what his wife’s doing. He apologizes for her behavior and suggests Saanvi lie and say she saved him. Saanvi can’t do that; she can’t lie because she’s a doctor. She also tells Jacob – in what comes across as one of the show’s few very forced scenes – about being lied to by someone she loved and she wouldn’t lie due to that, either. The person she loved was supposed to be on the flight with her but never showed up. Saanvi goes on to reveal that Jacob and Alice finding each other and being in love is a miracle. Jacob confesses to Saanvi that he doesn’t want to die. Meanwhile, Lourdes visits Michaela at the station and Michaela explains Jared’s standing watch over a retrieval job of finding a van supposedly full of money from the waterfront. Lourdes is fine with that because she actually stopped by just to speak with Michaela. They step outside and Lourdes asks if there’s something going on between her and Jared. The look on Michaela’s face gives her away and Lourdes goes off about her ruining her marriage and that she won’t even be able to look at Jared now. “I can’t apologize for still loving him,” says an upset and defensive Michaela. She reminds Lourdes that she never came to the hangar when she found out her best friend had come back. She also reminds her that when she returned it it had only been a month since Jared proposed. Lourdes leaves angry and upset. Back at Ben and Grace’s place, Grace encourages Zeke to talk to Cal. Zeke asks again to help him by drawing the wolf but Cal says he’s afraid that if he draws it then it will happen. Zeke suggests that Cal draw something fun and Grace encourages him to do it, too. Michaela and Ben check out the address Michaela pulled from the info Ben gave her. They can see Saanvi holding up her hands and obviously under duress through the window of an upstairs apartment. They can also tell she’s being held at gunpoint by Alice. Michaela calls in a hostage situation, but Ben’s afraid backup will take too long. He acts impulsively and buzzes Alice’s door. He tells Alice through the intercom that he’s one of the returned who’s come to help Dr. Bahl save her husband. She buzzes him in and Ben whispers to Michaela they might have to give Alice the miracle she’s looking for. Ben says he’s there to help Saanvi heal her husband, but with Alice’s negative energy it won’t work. She needs to lose the gun. Alice refuses to put down the gun until her husband’s cured. While Ben pretends to be praying to save Jacob, Michaela’s able to get the drop on Alice and disarm her. He continues but in a different tone, shooting Ben an intimidating look acknowledging that, yes, he’s scamming his followers. Adrian returns to preaching his false prophecies. Michaela heads over to Lourdes’ place but Jared answers and informs her Lourdes left. Jared believes they can start over now together with no more lies. Michaela refuses to talk to him about their relationship now, especially since Lourdes just left. Back at the house, Cal draws a picture of money and no money appears. Zeke tells him that he draws things that will happen but that doesn’t mean he’s making them happen. Zeke asks again to draw the wolf and Cal does but he says it wasn’t just a wolf. When Grace sees the drawing she calls for Ben. Ben walks over and sees the picture is of a wolf leaping at Michaela. At the waterfront, Michaela’s now standing watch as they’re finally fishing the van out of the water. Michaela walks over once the van is on the pier and opens the door. Water comes pouring out and the driver, who should be dead, lunges for Michaela.